two peas & the dog: home. everyone should compost. Or at least make an effort. I tried to do this in Seattle but getting a pail, refilling bags, finding a bin to throw it in (we lived in an apartment, compost bin always seemed to make its way back to a different spot). Since moving here, we have been composting beasts. Only because the city supplies you with a free pail and bags. Genius! 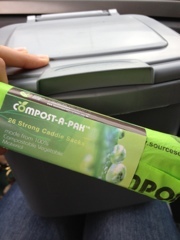 If you want your community to compost make it easy for them. Duh. Do it. Compost. Your garbage bill will thank you. food. your name shall be lucy. duke. loves the beach, hates the ocean.